The new qPCR systems are the latest additions to the QuantStudio portfolio from Thermo Fisher Scientific. Designed for low- to mid-throughput laboratories conducting real-time PCR experiments, QuantStudio 3 and 5 are the first to connect to the Thermo Fisher Cloud computing platform, allowing applied and clinical researchers to learn, analyze, share, collaborate, and obtain support within a single platform. Researchers worldwide can now collaborate online in real-time, and access their data wherever and whenever necessary. Laboratories can also share experimental conditions and results with their partners, while providing a uniform experience for every user, and helping minimize training and errors. 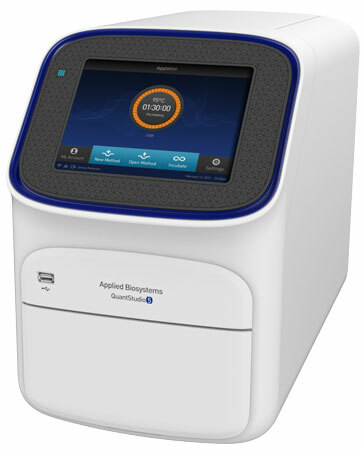 With the Applied Biosystems QuantStudio 3 and QuantStudio 5 Real-Time PCR systems hosted on AWS, these PCR systems benefit from the inherent security of the AWS Cloud. The AWS Cloud infrastructure is architected for flexibility and security, and provides an extremely scalable, highly reliable platform that enables customers to deploy applications and data quickly and securely. Researchers using the PCR systems can access their work any time they have an Internet connection, without the need for subscription software. The new instruments seamlessly integrate with existing analysis workflows, syncing with next-generation sequencing (NGS), capillary electrophoresis (CE) and qPCR applications to create a customized data ecosystem. Interactive touch screen controls allow scientists to directly manage experiments with intuitive commands. As with the existing QuantStudio 6, 7, and 12K Flex instruments, the 3 and 5 are competitively priced and include the state-of-the-art Thermo Scientific OptiFlex white LED optical system and VeriFlex thermal technology. Thermo Fisher is now accepting orders of the QuantStudio 3 and QuantStudio 5 Real-Time PCR systems for shipment in Q2. Applied Biosystems QuantStudio 3 and QuantStudio 5 Real-Time PCR systems are for research use only; not intended for diagnostic purposes.